MEMPHIS — During its earnings call Friday, Fred’s Inc. announced it is evaluating options for its retail pharmacy portfolio and “actively pursuing a sale” of its specialty pharmacy business, as it reported financial results for the 2017 fourth quarter and fiscal year ended February 3. The company’s financial results were originally slated to be released April 18. But, the day before, the company said it was pushing the report back a few weeks because it intended to sell the specialty pharmacy portion of its pharmacy business. Though net sales were up 2.1% to $477.3 million in Fred’s fourth quarter, the retailer’s “gross profit” decreased 8% to $115.1 million. He added that the retailer is evaluating various options of its retail pharmacy portfolio. “Some of the strategic transactions we are actively pursuing include a sale of our specialty pharmacy business and portions of our vast real estate portfolio. In addition, we are evaluating various options for our retail pharmacy portfolio. We’ve made significant progress on the expense side of our business, having identified $30 million to $40 million in operating cost reductions for fiscal year 2018, and our work in this area is far from over. We are bringing new talent into every part of the organization, including store operations, supply chain, private brands, finance and real estate. Additionally, we have multiple initiatives focused on driving revenue and gross margin in the front store, and we continue to actively manage and reduce our SKU count in order to optimize our assortment,” Anto explained. 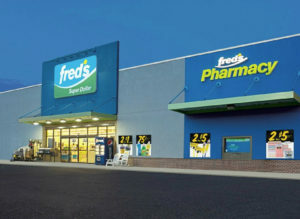 The announcement by Fred’s is the latest financial turnaround attempt for the retailer, which has 600 general merchandise and pharmacy stores, 12 franchised locations and three “specialty pharmacy-only locations.” The company said its main goals are to eliminate debt and generate “significant positive” earnings and cash flow. During the fourth quarter, Fred’s board of directors approved a plan to actively offer its specialty pharmacy business for sale. As a result of this decision, Fred’s reclassified the specialty pharmacy business from continuing operations to discontinued operations. The classification was evaluated under ASC 205-20, Presentation of Financial Statements – Discontinued Operations. The specialty pharmacy business operations have been removed from continuing operations as part of the presentation of the consolidated financial statements. The following financial results are for continuing operations for the current and prior-year periods, unless otherwise indicated. The earnings call comes on the heels of the news that CEO Mike Bloom had resigned from his post, effective on April 24. He also resigned from his seat on the company’s board. The company indicated that Bloom stepped down to pursue other opportunities, and said his resignation was not the result of any disagreement with the company or its operations. The post Fred’s pursuing sale of specialty pharmacy business appeared first on CDR – Chain Drug Review.